In heartbreaking testimony Thursday, a sobbing Patten man told the jury in the murder trial against Marcus Asante, 23, of Massachusetts, that he panicked when he saw that his friend was dead in the front seat of his car. 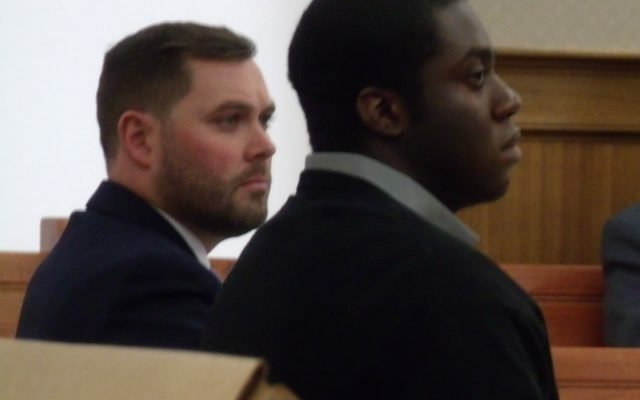 HOULTON, Maine — In heartbreaking testimony Thursday, a sobbing Patten man told the jury in the murder trial against Marcus Asante, 23, of Massachusetts, that he panicked when he saw that his friend was dead in the front seat of his car. Jurors started hearing testimony Monday in Aroostook County Superior Court in the trial against Asante, who is accused of robbing and fatally shooting Douglas Morin Jr., 31, of Oakfield on Oct. 16, 2016. Prosecutors allege that Asante is the one who pulled the trigger as Morin sat in his Lincoln Town Car on the PD Road in Sherman. Two other individuals, Darin Goulding, 29, of Leominster, Massachusetts, and Tia Leigh Ludwick, 24, also of Leominster, Massachusetts, also were implicated in the crime. Goulding pleaded guilty in February to robbery in exchange for the state dismissing a murder charge against him if he agreed to testify against Asante. He is facing up to 15 years in prison and will be sentenced later this year, according to prosecutors. Ludwick pleaded guilty in February to murder and robbery and was sentenced in April to 17 years in prison. According to Assistant Attorney General Donald Macomber, Ludwick, who was Morin’s cousin, contacted Morin about buying ten pounds of marijuana. After driving up to Maine to make the buy, however, Asante, Goulding and Ludwick were unnerved by Morin’s wish for them to meet him at an abandoned house in Sherman to buy the drugs, and also because he had brought along friends for security. They initially indicated that they did not want to make the purchase after seeing the other men present, but then agreed to it after Morin sent the two men away, because he “needed the money,” according to Macomber. Terry Smith of Patten, who was one of the two men who had accompanied Morin, admitted on the witness stand Thursday that when Morin needed more marijuana to sell to the Massachusetts trio, he illegally sold him seven pounds of the drug. Smith did not witness the shooting but told jurors that he was a short distance away from the road where Morin was shot and found him slumped dead in his vehicle on Oct. 16. He notified police and identified the red car that Ludwick, Goulding and Asante had driven to the location to make the drug buy. Earlier on Thursday, Goulding returned to the witness stand to resume his testimony from the previous day. He acknowledged to Assistant Attorney General John Alsop that he initially lied to police about his involvement in the crime, telling authorities that he had no idea that a robbery would take place and that he had never been in Morin’s car. He testified on Wednesday that he knew he was going to help steal drugs from the victim even before he got to Maine. Goulding testified Thursday that while the group was inside Morin’s car, Morin pulled out his marijuana and asked for payment. It was then, he said, that Ludwick, who was in the front passenger’s seat, grabbed the bag and Morin, who was in the driver’s seat, began tugging it back. He said that he saw Morin brandish a silver gun and that Asante, who was sitting in the back seat behind Morin, had a black gun. Goulding said he heard shots fired and got out of the car and ran to the other vehicle the trio had arrived in. Within moments, the three drove off in that car, but then quickly returned to the scene because Ludwick said she needed to get Morin’s phone to hide evidence that she and Morin had been texting about the drug deal. During a tough cross examination, Asante’s attorney, Brian Kelley, got Goulding to admit that he had lied and changed his story multiple times. The defense attorney pointed out discrepancies between Goulding’s statements to police two years ago and his testimony in court. Kelley also stressed to jurors that Goulding’s testimony resulted from a plea deal. Franklin Salcedo, 31, of the Dominican Republic, who was a roommate of Asante’s at the Cumberland County Jail, also testified against him Thursday with the help of an interpreter. He testified that Asante told him in jail that he had shot Morin. Salcedo also discussed a diagram that he had drawn based on Asante’s description of what happened showing Asante sitting in the back seat of the car. Kelley also maintained that Salcedo was only testifying due to plea deals offered to him, and cross examined Salcedo about his criminal history in Massachusetts and Maine, which includes drug charges and assault and battery on a police officer. The defense attorney got Salcedo to admit that he had access to Asante’s case paperwork in jail and had once been deported and snuck back into the country. Macomber has maintained that Asante was the one who pulled the trigger and shot Morin multiple times. Maine’s former deputy medical examiner, Dr. Claire Bryce, detailed for jurors on Tuesday the nine gunshot wounds she found during Morin’s autopsy, including fatal head and neck wounds. Macomber said that the marijuana stolen from Morin was found in an apartment that Asante shared with Ludwick, and that the gun used in the murder was found in Asante’s closet. Due to the forecast of several inches of snow Friday, Justice Harold Stewart II postponed continuation of the trial to Monday.